Free Mobile/Iliad (France) Archives · Stop the Cap! 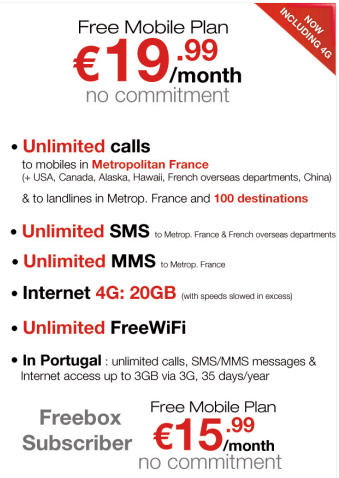 French ISP and mobile provider Free has boosted its promotion for inexpensive wireless calling with a family plan that provides unlimited calling within France, its territories overseas, the United States, Canada, Alaska, Hawaii, China, and nearly 100 other countries, unlimited SMS/MMS messaging, and up to 20GB of 4G data for $15 a month. The old off-promotion price (and for non-bundled customers) is around $20 a month. The promotion increases to four the number of family members that can participate, which means taking full advantage will result in a monthly cell bill of around $60. A comparable Family Share plan from AT&T offering 20GB of rollover 4G data costs customers $150 a month… for one line. The French Revolution in wireless could be spreading across the United States if Paris-based Iliad is successful in its surprise $15 billion bid to acquire T-Mobile USA (right out from under Sprint and Japan-based Softbank). Wall Street hopes it isn’t true. If you named one wireless carrier in the world guaranteed to provoke groans, sweat, and Excedrin headaches from powerful wireless industry executives living high on 40%+ annual margins, Iliad and its notorious Free Mobile would be the chief provocateur. Initially dismissed as an irrelevant upstart (much like T-Mobile itself) when it announced service on a less-robust network in 2012, as soon as Free Mobile announced its groundbreaking prices, panic was rife in the boardrooms and executive suites of competitors Orange, SFR and Bouygues Telecom, who couldn’t slash their own prices fast enough. 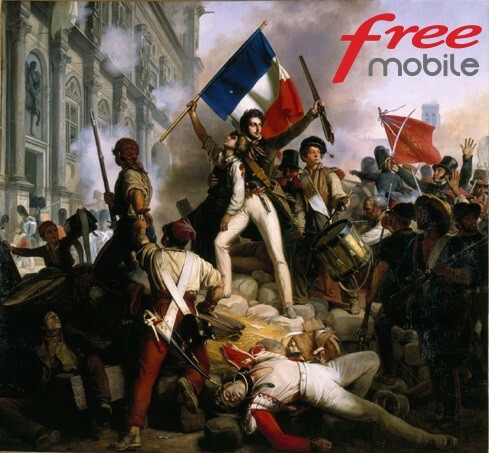 In short order, Free Mobile has taken nearly five million of their competitors’ very profitable customers in France, mostly from its vicious price-cutting that results in rates half that of any other competitor. Orange and other carriers promptly announced slashed shareholder dividend payouts and implemented cost-saving measures after being forced to cut pricing. American wireless executives visiting Europe were aghast at the prices charged by the French upstart, suggesting they were reckless and would eliminate necessary investment in upgrades. Although France has been behind the United States in launching 4G service upgrades, French customer satisfaction with their wireless service is higher than in the U.S., and Free Mobile has the lowest customer loss (churn) rate of any carrier in France. Iliad’s reputation as a nasty competitor is fine with self-made billionaire CEO Xavier Niel, who has become extremely wealthy selling cutting edge, yet affordable, telecommunications products without losing touch of his more modest roots. But he is reviled by most of his competitors for disrupting the comfortable wireless service business models his competitors have maintained for years. Niel has thrown marketing bombs into every sector of the French telecom market, ruthlessly cutting prices for customers while relying on in-house innovations to keep costs low. Free’s customer care center is run on Ubuntu-based, inexpensive notebook and desktop computers. Free’s wired broadband, television, and phone service is powered by set-top boxes and network devices custom-developed inside Iliad to keep costs down. Its creative spirit has been compared to Google, much to the chagrin of its “business by the book” competitors. “It’s not done like this,” is a common refrain heard when Free Mobile announces more price cuts, an easing of usage caps, or completely free add-ons. Unlimited free Wi-Fi on Free’s extensive Wi-Fi network. A Free Mobile customer that also subscribes to Free’s wired broadband or television service gets an even bigger discount. Their monthly wireless bill for the same features? $21.40US a month. Niel said the reason he has not brought the Free Mobile brand to the United States is because the wireless industry here is highly anti-competitive. The fact T-Mobile USA is now up for sale represents ‘the opportunity of a lifetime,’ a “one-time opportunity to enter the world’s-largest telecoms market,” a person familiar with the matter said prior to the announcement. A number of Wall Street analysts who prefer the current business model of high cost/high profits are keeping their fingers crossed the Iliad offer is just a pipe dream. Some, including analysts on Bloomberg TV, dismissed Niel as a former pornographer and suggested “for the guppies, it is whale season,” a reference to Iliad’s small size relative to T-Mobile USA. “To say this is surprising is something of an understatement; it is one of the most bizarre bits of potential M&A we have ever witnessed in the sector,” said analysts from Espirito Santo in a note to investors. Should Free Mobile enter the United States, its cutthroat pricing would make CEO John Legere’s “bad wireless boy” campaign to make T-Mobile the “uncarrier” quaint in comparison. Every wireless carrier in the U.S. could be forced to cut rates by one-third or more to stay competitive should Niel adopt a similar business model for Free Mobile in the U.S. market. Some worry that Softbank’s bid to merge Sprint and T-Mobile together has just become even less likely with the possibility of a new player in the U.S. market, competing against three other carriers, not two as the Softbank deal proposes.